Automotive Reprogramming & Diagnostic Scan Tool for All Makes and Models. Vehicle reprogramming tools are becoming an essential auto diagnostic tool in automotive repair shops. Technicians often come across OEM Technical Service Bulletins that require them to reprogram the vehicle with the latest OEM calibration files in order to diagnose and repair car problems such as check engine light, gas mileage, false DTCS, shifting, hesitation, rough idle, emissions quality, ABS, performance and more. Key Reprogramming, immobilizer Adaptation and more OEM-specific data! 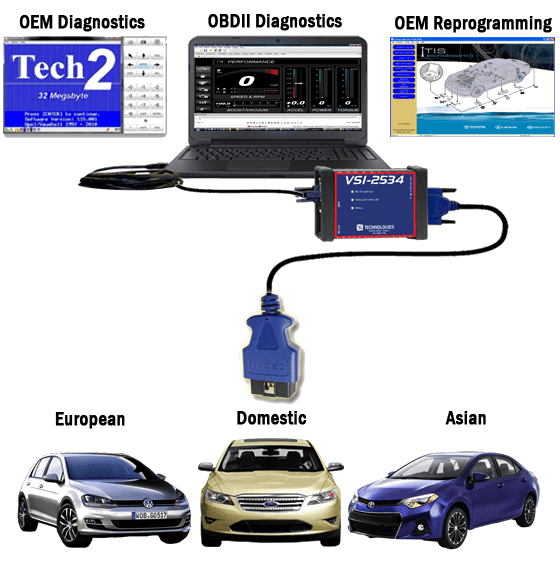 Out-of-the-box essential diagnostic capability using DG Diagnostics OBDII software. VIN number, emmissions-related data, Freeze frame, data monitoring, data logging, read/clear DTCs and more! For questions about J2534 Automotive reprogramming questions, visit our J2534 FAQ page. To view or subscribe to an OEM service website to use in conjunction with the VSI-2534 pass-thru box, view the links on the OEM Reprogramming Sites page. For OEM Subscription Reprogramming Instructions, see the “OEM Reprogramming Guides” listed on the Documents Page.